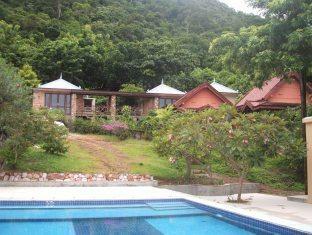 If what you're looking for is a conveniently located hotel in Kep, look no further than Tree Top Bungalow. From here, guests can enjoy easy access to all that the lively city has to offer. For those of you who want to venture out, Knai Bang Chatt Sailing Club, Kep Crab Market, Crab Market are just some of the attractions available to visitors. At Tree Top Bungalow, every effort is made to make guests feel comfortable. To do so, the hotel provides the best in services and amenities. The hotel offers access to a vast array of services, including free Wi-Fi in all rooms, valet parking, car park, room service, restaurant. The ambiance of Tree Top Bungalow is reflected in every guestroom. clothes rack, mirror, towels, closet, internet access � wireless are just some of the facilities that can be found throughout the property. The hotel offers many unique recreational opportunities such as garden. 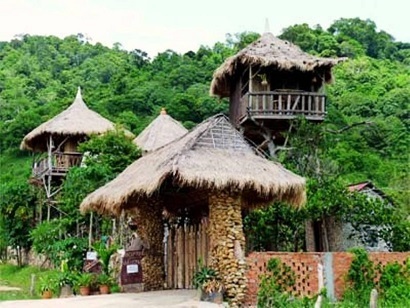 Tree Top Bungalow is a smart choice for travelers to Kep, offering a relaxed and hassle-free stay every time. 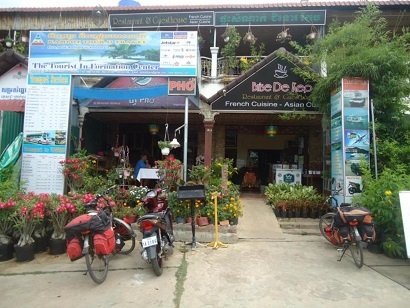 Brise De Kep Restaurant & Guesthouse, located in Prey Thum, Kep, is a popular choice for travelers. From here, guests can enjoy easy access to all that the lively city has to offer. With the city's main attractions such as Kep Beach, Samathi Pagoda, Phnom Voar Mountain within close reach, visitors to the hotel will just love its location. Take advantage of a wealth of unrivaled services and amenities at this Kep hotel. Guests of the hotel can enjoy on-site features like free Wi-Fi in all rooms, Wi-Fi in public areas, car park, restaurant, laundry service. Hotel accommodations have been carefully appointed to the highest degree of comfort and convenience. In some of the rooms, guests can find towels, internet access � wireless, internet access � wireless (complimentary), non smoking rooms, air conditioning. Besides, the hotel's host of recreational offerings ensures you have plenty to do during your stay. When you are looking for comfortable and convenient accommodations in Kep, make Brise De Kep Restaurant & Guesthouse your home away from home. Located near Srey Sor Sand, Mealea Resort is truly a delightful, romantic, and boutique hotel offering comfortable rooms and impeccable service. With its central location, this 3-star resort has close proximity to several must-see destinations. 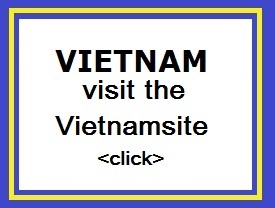 Crab Market, Ministry of Tourism, Koh Tonsay, and Phnom Sor Sear can be reached within a short distance. Sihanuville is only an hour away from the property. Set in French-styled d�cor, Mealea Resort features 11 bungalows for singles, couples, families with children, and business travelers. All rooms are equipped with a wide range of facilities and amenities. If you're looking for a home on the Kep Beach, there's only one Mealea Resort for you. Situated along the coastline within a 2-minute walk from Kep Beach, Beach Town Guesthouse operates a 24-hour front desk and offers complimentary usage of the business centre. Free Wi-Fi access is available in the entire property and parking is provided at no charge. The guesthouse is just a 5-minute walk to the nearest bus station located close to Kep Beach. The famous Crab Market is a 10-minute drive away, while Tuek Chhour Waterfall is within 30 km away. Fitted with tiled flooring, comfortable rooms are simply furnished with a fan, wardrobe and a TV with cable channels. Rooms come with an attached bathroom offering hot/cold shower facility and free toiletries. 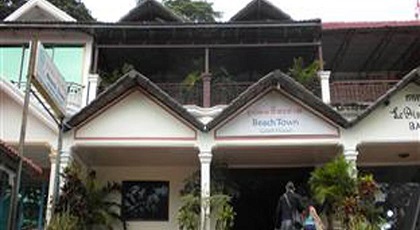 At Beach Town Guesthouse, guests may rent a car to explore the area or approach the tour desk for assistance with sightseeing activities and travel arrangements. Safety deposit boxes are provided at the reception, while luggage storage and laundry service is available. The in-house Bungalow Kep Restaurant serves tasty Khmer and Western dishes, along with a variety of drinks to choose from at the bar. Well-placed in the beaches, restaurants area of Kep city, N4 Guesthouse provides a most conducive spot for you to take a break from your busy days. The hotel is not too far from the city center: just 0.5 Km away, and it normally takes about minutes to reach the airport. This modern hotel is in the vicinity of popular city attractions such as Kep Crab Market, Crab Market, Knai Bang Chatt Sailing Club. Take advantage of a wealth of unrivaled services and amenities at this Kep hotel. The hotel provides 24-hour room service, free Wi-Fi in all rooms, Wi-Fi in public areas, car park, room service to ensure our guests the greatest comfort. N4 Guesthouse is home to 18 bedrooms. All are tastefully furnished and many even provide such comforts as television LCD/plasma screen, fireplace, free welcome drink, mirror, slippers. Throughout the day you can enjoy the relaxing atmosphere of the massage, garden. When you are looking for comfortable and convenient accommodations in Kep, make N4 Guesthouse your home away from home. Standing tall at about 200 meters above sea level, Vanna Hill Resort boasts a beautiful background of the majestic Kep National Park, a welcoming place from the tropical heat since the colonial days. Whether from Cambodia or international, Vanna Hill Resort is an ideal retreat for holidaymakers and business travelers alike. Featured as a bungalow-styled resort, the hotel offers local Khmer and Western set-up with 20 elegantly designed rooms allowing you to capture the breathtaking views of the Gulf of Thailand, spectacular Bokor Mountain highland landscapes, and Phu Quoc Island of Vietnam. Vanna Hill Resort is a wonderful escape.